A network analyzer is a tool that allows you to look into a network and prevent hacks by analyzing data going across the wire for network optimization, security, and/or troubleshooting purposes. A network analyzer is handy for sniffing packets on the wire. It works by placing the network card in promiscuous mode, which enables the card to see all the traffic on the network. View anomalous network traffic and even track down an intruder. Develop a baseline of network activity and performance, such as protocols in use, usage trends, and MAC addresses, before a security incident occurs. WildPackets’ OmniPeek It does everything you need and more and is very simple to use. OmniPeek is available for Windows operating systems. TamoSoft’s CommView is a low-cost, Windows-based alternative. Cain & Abel is a free multifunctional password recovery tool for performing ARP poisoning, capturing packets, cracking passwords, and more. Wireshark, formerly known as Ethereal, is a free alternative. It’s not as user-friendly as most of the commercial products, but it is very powerful if you’re willing to learn its ins and outs. Wireshark is available for both Windows and OS X.
ettercap is another powerful utility for performing network analysis and much more on Windows, Linux, and other operating systems. What’s entering your network before the firewall filters eliminate the junk traffic. What’s leaving your network after the traffic passes through the firewall. Reconnaissance probes and system profiling from port scanners and vulnerability assessment tools, such as a significant amount of inbound traffic from unknown hosts — especially over ports that aren’t used very much, such as FTP or telnet. Hacking in progress, such as tons of inbound UDP or ICMP echo requests, SYN floods, or excessive broadcasts. Nonstandard hostnames on your network. For example, if your systems are named Computer1, Computer2, and so on, a computer named GEEKz4evUR should raise a red flag. Hidden servers that might be eating network bandwidth, serving illegal software, or accessing our network hosts. If your network analyzer permits it, configure it to use a first-in, first-out buffer. 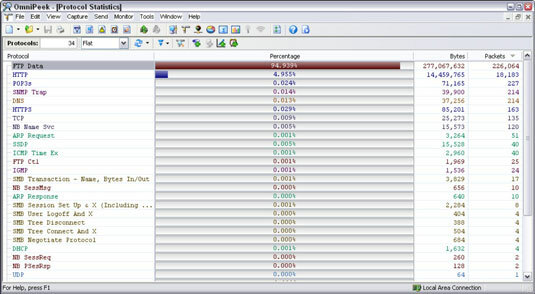 If your network analyzer permits it, record all the traffic into a capture file and save it to the hard drive. This is the ideal scenario — especially if you have a large hard drive, such as 500GB or more. When network traffic doesn’t look right in a network analyzer, it probably isn’t. It’s better to be safe than sorry. You can check for is the top talkers on the network. If someone is doing something malicious on the network, such as hosting an FTP server or running Internet file-sharing software, using a network analyzer is often the only way you’ll find out about it. A network analyzer is also a good tool for detecting systems infected with malware, such as a virus or Trojan horse. Looking at your network statistics, such as bytes per second, network utilization, and inbound/outbound packet counts, is also a good way to determine whether something fishy is going on. TamoSoft — the maker of CommView — has another product called NetResident that can track the usage of well-known protocols, such as HTTP, e-mail, FTP, and VoIP. You can use NetResident to monitor web sessions and play them back. NetResident also has the capability to perform ARP poisoning, which allows NetResident to see everything on the local network segment. Certain IPSs can also detect whether a network analyzer is running on your network. These tools enable you to monitor the network for Ethernet cards that are running in promiscuous mode. You simply load the programs on your computer, and the programs alert you if they see promiscuous behaviors on the network (Sniffdet) or local system (PromiscDetect).